Well, I’ve done it again. While cruising the web, I found two guitars I just couldn’t pass up for their relative prices, so after some light talks with the sellers, both arrived at my home this Thursday. First up, the Charvel Model 5. I originally purchased this mainly as a flipping opportunity, due to it’s great condition coupled with an irresistible price. 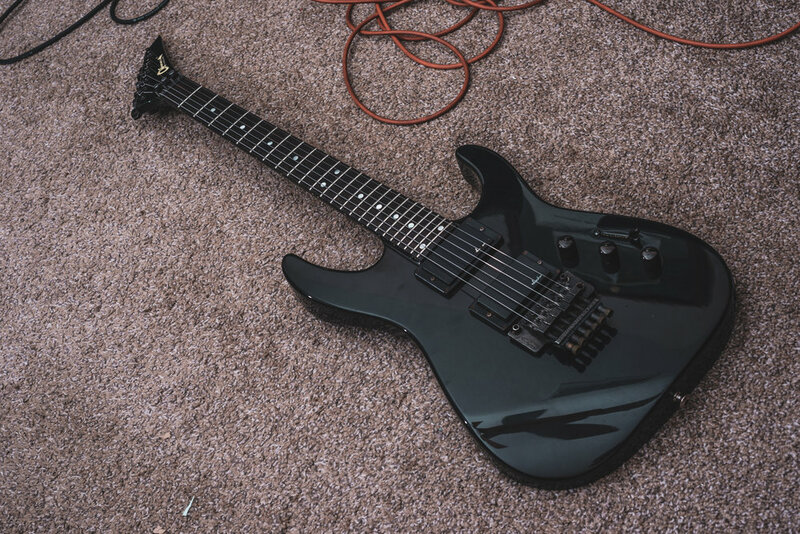 Additionally, I’ve always wanted a neck-through guitar and a Charvel model 5, 550, 6, or 650 is right at the top of that list - with the added benefit of trying out some pickups I’ve never had before, the Jackson J80C. I did hope that the bridge pickup was a J90C or J95, but I wasn’t quite that lucky, both neck and bridge pickups are J80C’s. The guitar interestingly has a 5-way switch despite having two pickups, and I just learned about this feature. It’s the Jackson JE-0005 “super switch.” Essentially, a standard 5-way switch has a few terminals and the way it switches sounds is by combining the outputs from each pickup in different ways, while this “super switch” has individual terminals for each possible switch position, so in theory you could wire it a multitude of ways impossible on a standard switch. There is a helpful write-up here on the JCF forum: https://www.jcfonline.com/threads/90074-Jackon-Special-5-Way-wiring-tutorial. This guitar is stock, so the switch goes from neck (series humbucking), neck single coil, both pickups series (all four coils), bridge single coil, and bridge (series humbucking). It takes a little while to get used to it, but I think I prefer this arrangement more than the usual selector + coil tap mini switch. It’s certainly much quicker to use and requires a bit less fiddling when making quick transitions between humbucking and single coil sounds. This switch was also available on the Model 3A and 3DR of the same era, as well as the Predator later on. It also comes equipped with a JE-1200 mid-boost circuit, which offers up to +6db of boost at around 650hz. On my Model 4’s and 475 Deluxe, I considered this boost an “always on” item that was required to avoid overly bright/shrill tones with the J50BC pickup. However, the J80C’s on this guitar have much thicker mids, and the boost is not as obvious - and certainly not required. That’s great, because I can leave it rolled off for rhythm or clean tones, then roll it up - though a clean amp I get a nice volume and edge-of-breakup sound, fantastic for soloing, and through a distorted amp I get just a little bit more saturation and push. This is a big advantage for me, as with the Model 4’s I’ve always felt like the mid boost feature was kind of worthless because it didn’t give me any extra options - it had to be on all the time. Next I need to get my hands on a J90 or J95 humbucker to try out, since those should have a little bit more output and thicker mids based on the specifications. The G&L Invader Plus was a lucky acquisition, as I don’t usually look for guitars made past about 1990. I didn’t know much about this model, so I did a lot of digging and research on features, specifications, and values prior to purchasing. Everything came back looking like exactly my type of guitar, so I went for it. The quality of wood on this guitar is truly impeccable, and with quality hardware it’s truly an elite instrument. The figuring of the top is really nice, and a bit more interesting than some of the more common quilt or flame tops that look to me a bit too perfect. The grain gives a sensation of depth even though this top is not that thick, and the natural binding around the edges gives a nice separation between the cap and the mahogany body. The neck is really where it ramps up though, with some strong flame figuring on the player’s side of the neck that' is really nice to look at. The fretboard and neck is constructed entirely from a single piece, so the fretboard also possesses much of the same figuring. The flame is accompanied by a strong birds-eye figuring as well, so the neck really has a lot to appreciate. I was hoping for a different bridge pickup (this has a Duncan JB, of which I have 7 or 8 at this point), but it sounds very thick and warm in this guitar so it’s hard to deny it’s a great sounding guitar. The JB can be a bit touchy depending on the guitar - for example, my ‘89 Pacer Custom I had a JB originally and it was so frustrating to have such a nice guitar sound so thin and harsh on almost all of my amps. The ‘59 is a neck pickup I’ve never had the chance to own before, so it’s nice to be able to play one of the bread and butter pickups so commonly discussed among guitar players. It has a great sparkle through a clean amp that none of my other guitars can quite match. That said, the neck on this one is quite thick in comparison to my other guitars and I’m a bit surprised myself that I’m reaching for the Charvel above more than this instrument. Part of that is the G&L is in impeccable shape, with not even a visible scratch on it - it arrived with the original case, hang tags, certificate of authenticity, and even the plastic film still present over the plastic cavity covers. I’m almost afraid to play it for fear of marring its perfect form. Still, it has one of the most toneful clean sounds I’ve ever heard from an electric and I expect to be using it for those styles - perhaps this would be a good guitar to try some lower output pickups in (perhaps a Pearly Gates, or ‘59 Bridge? ).